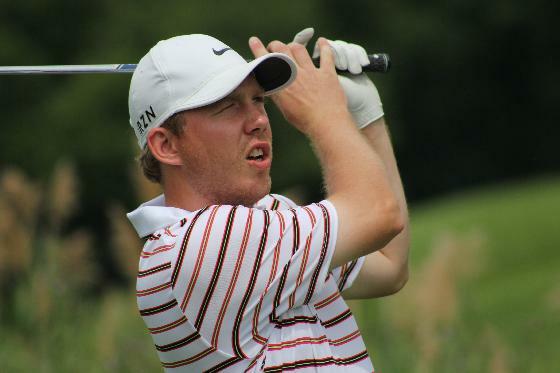 Ryan Johnson won 3 and 1 over Kory Roberts to take the 2015 Michigan Amateur Championship Friday at Plum Hollow. Johnson, 30-year-old club-fitter at Carl’s Golfland, had earlier escaped with a 1-up victory over 17-year-old Austin Jenner of West Branch. Roberts, from Battle Creek, advanced to the final with a win over Highland’s Bret Quitiquit. That match lasted nineteen holes. “I started playing golf when I was 10, started playing in the Michigan Amateur at 16 and this is why I play competitive golf, to do this,” said Johnson, a Novi resident who grew up in New Boston and last year won the Golf Association of Michigan (GAM) Championship, his first major amateur title. Both players admitted fatigue set in during the championship match. They routinely missed fairways with tee shots after hitting the majority of them through the week and scrambling for par became critical. Johnson, a Type 1 Diabetic since high school, said it wasn’t a factor. He was simply worn out from eight rounds of golf in five days. A par save at No. 10 tied the match, a par save at No. 12 put him 1-up and then a par save at 14 put him 2-up. He won the 17th hole despite tree trouble with another par because Roberts was in the trees twice. That closed out the match 3 and 1. Johnson was elated to accept the Staghorn Trophy that dates to the early days of the 104-year-old tournament.